What's the Best Android TV Box (2017/2018 Edition)? Posted on December 26, 2017 June 26, 2018 by cnxsoft - 18 Comments on What’s the Best Android TV Box (2017/2018 Edition)? Since I was often asked which TV box to buy, I wrote a guide entitled “What’s the best Android TV box?” in April 2016. Time has passed, new products have launched, I tested more devices, and got further reader feedback, so it’s time for an update. There’s still no device that rules them all, and since everybody has different requirements and price points, what could the best Android TV box ever to one person, maybe be a piece of junk to another. Before purchasing a TV box, you should consider what you plan to do with it, and find the device with matches your needs and budget. So first, I’ll provide a list of things to look for – beside the SoC/RAM selection – before selecting three TV boxes that stand out (in no particular order), as well as alternatives worth looking at. Official Android TV OS – Pick such device if you want the original experience with leanback launcher, and access to streaming services like Hulu, Netflix an so on. This operating system should come with all/most the licenses needed for streaming, is specially designed for the large screen, and works well with the IR remote control. However, you’ll only be able to easily install apps specifically designed for the TV (e.g. no Chrome browser, unless you sideload it), and the system may not always work well with an air mouse or wireless keyboard/touchpad. Android OS – Most – not to say all – boxes you’ll find in China are running Android operating system made for smartphones with customizations for the big screen. Those devices have good flexibility, since you can install pretty any app from the Google Play store, and they come with a launcher made for the big screen. The downside is that only parts of the interface or some apps will be usable with the IR remote control, so you’ll need to use an air mouse, wireless keyboard, or smartphone app to have good control of the device. Most boxes also lack proper DRM and other licenses, which may restrict the streaming services you may access, or at least the playback resolution. Android + Linux – Dual boot systems have been around for a while, and IMHO not very useful, so what I’m referring to here are systems with two operating systems running at the same time with Android for media playback, and Linux for NAS/server functions. I’ve seen devices with OpenWrt or Debian so far. History of regular firmware updates – If a company provides regular OTA (over-the-air) firmware updates, your device is likely to get better and better overtime. The cheapest TV boxes normally follow the ship-and-forget model, so you can’t expect any improvements, unless some community members offer custom firmware. Support forums – Most reputable companies selling to end users offer support forums. For cheaper boxes, you won’t get any support, except through communities like Freaktab. 4K & HDR Support – If you want to purchase a device that will support 4K videos, and the latest HDR (High Dynamic Range features) you should look for devices with HDMI 2.0a for 3840×2160 or 4096×2160 output up to 60 Hz and HDR. Double check 4K video codecs support (10-bit HEVC/H.265, VP9, H.264), and make sure they can decode the framerate used for your videos. The latter is usually not a problem with H.265, but sometimes it could be for VP9 or H.264 since some systems can only handle 30 fps or 24 fps. 5.1 or 7.1 HD audio pass-through support – In case you own an amplifier or A/V receiver capable of handling Dolby TrueHD, Dolby Atmos, DTS HD Master, DTS HD High Resolution, or DTS:X, you really need to check the reviews on this site or others, as many devices fall short despite claiming support. Automatic frame rate switching – This is the ability of the device to match the monitor refresh rate to the video frame rate to avoid a phenomenon called micro stutter, which makes the videos not as smooth as it could be at regular intervals, and especially noticeable when the video is panning. if this is properly implemented, e.g. 24 fps videos played using 24 Hz on the monitor, then micro-stutter disappears. DRM support for HD and UHD video streaming – If you’re paying for video streaming services like Netflix, you’ll have to make sure they are specifically supported, with Widewine Level 1 DRM necessary, but not sufficient condition for playing the videos at HD or UHD (4K) resolution. Most devices can only stream videos in SD resolution due to the lack of proper DRM and a hard-to-get “Netflix license”. Thermal design and storage performance – Many Android TV boxes have similar specifications, but IMHO, two key design choices are especially impacting the performance between apparently similar devices. Some TV boxes will overheat over time, leading to poor performance after a few minutes, while others with proper cooling will perform the same over hours. Fast storage will ensure the device boots quickly, apps load fast, and the device does not get slowed down while apps are installing or updating in the background. History of regular firmware updates – MINIX normally updates their devices for about a year or so. Support forums – MINIX forums are fairly active, so you should be able to get decent support from MINIX themselves or the community of users there. 4K & HDR Support – HDMI 2.0a up to 4K @ 60 Hz is supported, with very good support for 4K 10-bit H.265, VP9 and H.264 videos. 5.1 or 7.1 HD audio pass-through support – Dolby TrueHD and DTS HD audio pass-through both working. DRM support for HD and UHD video streaming – Widewine Level 1 & Microsoft PlayReady implemented. However, Netflix can only play up to SD resolution, or possibly up to HD (720p) with a trick, but not full HD, nor UHD since Netflix requires a separate agreement. Thermal design and storage performance – Good cooling thanks to a large heatsink, and very fast internal storage. Just like MINIX NEO U1 I recommended last year, as long as you don’t need Netflix Full HD or 4K UHD playback, and are happy using their custom launcher and an air mouse, MINIX NEO U9-H should definitely be in your list of devices to consider. Please read MINIX NEO U9-H review for details, taking into account that some bugs may have been fixed since my review in March 2017. Price: $149.90 and up with NEO A3 Lite air mouse on Amazon US, GearBest, GeekBuying, and other sellers. You can also find the box only (without air mouse) for around $139.90. 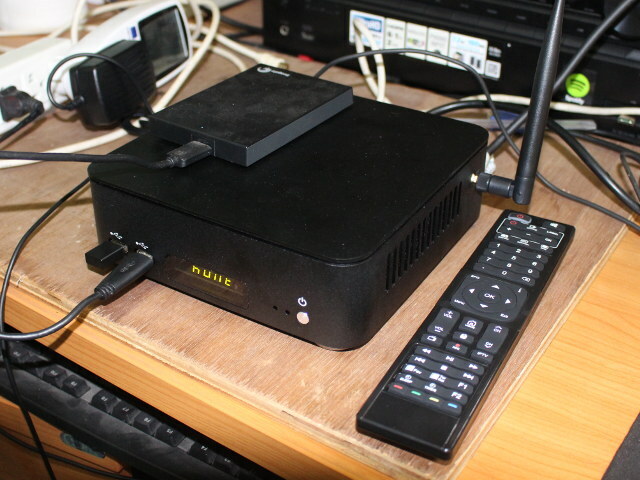 U5PVR Deluxe made it to the top three list because of all the extras like tuners and a 3.5″ SATA drive, and the fact that it runs both Android TV OS (unofficial) and Debian. Operating System – Unofficial Android TV 5.1 OS and Debian running at the same time. Android TV 7.1 is now also available, as well as a dual boot image with Enigma2. History of regular firmware updates – The company has released several firmware updates since the review. Previous model was U4 Quad Hybrid – Launch: January 2016; last firmware update: November 2016. So a little under a year of firmware updates. Support forums – Available on SmartSTB forums (Somewhat active), or Google+ (not so active). The device is not as popular as MINIX models, so you’ll have less users involved. 5.1 or 7.1 HD audio pass-through support – Dolby TrueHD and DTS HD audio pass-through worked in Media Center app. If you live in a country where DVB-T/T2 is supported (or various combination or DVB-T/T2/C, ATSC, DVB-S2 if you purchase an additional tuner board), and plan to use the Linux NAS features, U5PVR Deluxe looks certainly like a good candidate. However, if you mainly want to watch video streams from Netflix, Hulu, and other premium services, and use Kodi, there should be other devices that better fit your needs. Price: $229.99 including shipping on Aliexpress. 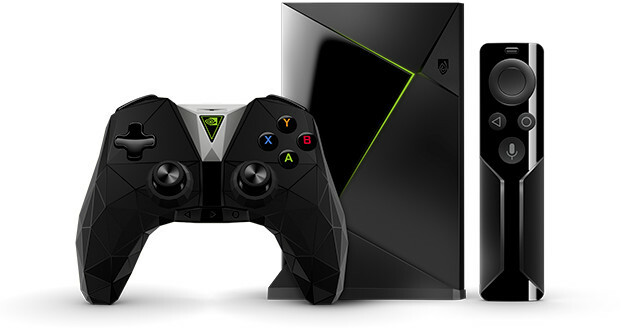 NVIDIA has launched a smaller version of their popular Shield Android TV earlier this year, and while I have not reviewed the device myself, it’s one of the most popular Android TV box on the market. Support forums – Active SHIELD Android TV board on Nvidia Geforce forum. 4K Support – HDMI 2.0a up to 4K @ 60 Hz is supported with support for 10-bit H.265, VP9 and H.264 video playback @ 60 fps. Automatic frame rate switching – OK for Kodi and Plex at least. Thermal design and storage performance – Good storage performance, and I only read reports of isolated issues with overheating (i.e. not a design issue). NVIDIA TV box also features the most power GPU of any TV boxes, so it’s also an excellent 3D gaming console. Availability is still an issue, although the company has launched the model in some more countries this year. This also means the device can be pretty expensive once you factor shipping, custom duties, and other fees (e.g. forward shipping) if you purchase it from a country where the device has not officially launched. Just like other devices running Android TV OS, not all apps will be available from the Play Store. Price: Around $200 on Amazon US. The three devices are not the only ones to consider, and other alternatives could meet some people requirements. I hope this guide will help some to decide on which model to buy. Feel free to comment if you think another model should be part of the top 3, or the list of alternatives. What’s the Best Android TV Box? From personal experience, the best Android TV box is a Wintel PC. Comparable size, power specs and cost. Much better system level support for add-on hardware, OS updates and even OS replacement. Most Androids apps have a Windows equivalent (Kodi for example) but if you do find an Android only app that you just gotta have, there are a number of very competent Android emulators. One of my favorites is Nox Player. Personal opinion: Android as an OS is designed to promote hardware sales. If you like disposable hardware, Android is definitely the way to go. Are there any news reports about an AmLogic-based Android box which would come pre-installed with Oreo? And some news about AmLogic’s upcoming SoCs – a new roadmap? Not sure about the status if the Oreo SDK, maybe it’s too early, even official Android TV devices like the Nvidia shield are still on Nougat. Not leaked roadmap this time. By this time, I would have expected Amlogic S805X devices to come out (low cost version up to 1080p), but maybe they canceled it. Future models include Amlogic S922 and S925 but I don’t have much details apart from “next-gen CPU and GPU”, 4K HDR decode, 4K encode, MIPI-DSI+CSI, PCIe, USB type C support. MIPI DSI probably means S92x chip will be used in 2-in-1 hybrid, or tablets. My vote is Nvidia shield. 2 years old now going strong. Still getting updates. I got the home automation dongle but have not turned it on yet. I use gamestream from PC and Plex server and all the video apps. Only down side we have is no native app for DirecTV Now but that is not Nvidia fault. Have to cast from phone or tablet. You are doing a great disservice to your readers by failing to differentiate between the Xiaomi MiBox MDZ-16-AB which is the only box from Xiaomi that carries official AndroidTV and its requisite DRM facilities and licenses. Xiaomi makes a plethora of boxes, all of which are specifically designed for their home market in PRC with the sole exception of MDZ-16-AB. Only the MDZ-16-AB can be used to its fullest extent in all international markets and owners can be assured of Netflix support in HD and UHD, Chromecast function and allied DRM priveleges, as well as a full gamut of language options. It is exclusively sold in USA by Walmart but there are a number of legitimate sources on Aliexpress and other places who can supply the genuine article to buyers in other countries. it’s all about expectation. If you expect only one function, go with the cheapest box that provides it. But if you expect more longevity and versatility, I would recommend a different approach. CNX’s What’s the Best Android TV Box (2017/2018 Edition)? Update information about U5PVR Deluxe. 2. ATM 7.0 supports DRM L1 and supports Netflix 4K playback. 4. Supports 4K UHD Blu-ray navigation. We plan to support the same Android TV OS as U5PVR in U5 SBC (Single Board Computer) next year (2018) in small size board (GPIO 40pin support). Looking forward to seeing your U5 SBC. You may consider making your firmware easier to find, maybe as pinned post. I’m unable to find ATV 7.0 official release in your forums. I could not find any demo about Netflix 4K either (only 480p). Hello CNX! I am using U5PVR Deluxe too! I also had trouble finding the firmware. I’ll give you a link. I upgraded Android7 last month (upgrade 17.12.22 version). We do not have the contract but Netflix 4K works. I believe we are the only one so far. We did a lot on our own firmware side to make this happen. If you have any issues, please let me know. They key part is to have the correct mac address programmed otherwise not possible to update DRM or Enigma2. Thanks for answer. I cleaned up the many external links, since I got answer from Vivant above. I had the same problems. The most important thing to know is, that you have to **manually** do the major upgrade from ATV5 to ATV7 following the instructions posted in their blog.